Taking the top spot, the O-Cedar Angler broom combines a number of subtle-yet-smart features to make the task of sweeping up a floor easier and quicker. While other brooms on this list use a similar design, this one stands out with a durable build quality in combination with the ergonomic head and handle. In total, this is the broom you will want to have within reach the next time you tackle the home’s hard floors. The broom has a higher bristle density, offering up to double the number of bristles as regular options. This allows the head to pick up smaller particles with each sweep so you aren’t leaving any dirt or dust behind. The angled head uses bristles that gradually increase in length to provide a flat surface that continuously touches the floor. The included dustpan has the same width so you can push the mess into the tray without worrying about oversweeping. Brooms tend to range in price from bare-minimum options to products that might raise your eyebrow at their expense. Budget brooms will skew the lower end of this price range and can be hit or miss on their build quality. To avoid losing bristles and breaking handles, choose the Libman Extra Large broom for something that will hold together and pick up small dust and particles all at once. Despite the small price tag, this broom offers a high build quality using a thick, polypropylene broomstick that can resist hard knocks and bending. The head has a slight bend to angle the brushes for better handling and extension. Using recycled water bottles for the bristles, this broom is also an eco-friendly option for people wanting to keep their impact down on the environment. The position of the head and handle on a broom will affect how well you can comfortably sweep for long periods of time. An ergonomic angle design places the broom diagonally to the floor so your hands fall into a natural position. An angled head also increases the reach of the broom for hard-to-reach spaces under counters and furniture. For the best-angled head, the OXO Good Grips broom is a top-notch choice. This broom has a slight angle on the head for ergonomic positioning and handling while cleaning a hard surface in the home. While plenty of brooms have the same angled design, the Good Grips stands out due to its telescopic handle and heavy-duty dustpan. The handle will adjust to your height for maximum comfort. The dustpan is oversized and includes upper teeth to run through the bristles, catching and freeing any leftover debris to keep the broom head clean after each use. Pet hair presents a unique challenge to sweeping up hard surfaces. Unlike your common dust and dirt, pet hair has a habit of clinging to things. The fact that pet strands will also tangle around the bristles of a normal broom doesn’t help. That is why the O-Cedar Dual Action broom comes with a hidden second cleaning surface set in between the bristles to keep pet hair from making a complicated mess. The main head of the broom is divided by a foam blade that will push pet hair around while the bristles clean dirt and dust on the floor. The blade is solid and dense so you don’t have to worry about damaging it or the floor underneath while sweeping away. You can also remove the blade to turn the head into a normal broom for everyday cleaning tasks that don’t require the extra pickup. The traditional corn broom might conjure up images of old-fashion frontier living where you have to sweep up the cabin floor, but these brooms still have their place. In many ways, corn brooms offer the maximum amount of durability since their bristles are virtually indestructible. Using denser materials, a broom like HDX Heavy Duty corn broom can also deal with heavier, tougher debris other brooms might just scrape over. This broom wins the outdoor category due to its wire-wound bristle head reinforced with three sews. This creates a heavy duty cleaning surface that will resist tearing or buckling under larger rocks, heavy dirt/mud, or other elements you may clean outdoors. The head is one foot wide and includes a 40 inch lacquered wood handle for extra durability while sweeping the patio, driveway or other outdoor spaces. And this isn't just good for outside, it can be used in every room indoors as well. What would a broom be without a dust pan? All of that dust and debris needs to go somewhere. Short of sweeping the dirt directly into the trashcan, a handy dust pan makes containment of small and large messes alike easy. Better still, a small broom and dustpan set will help when the cleaning task is too small to warrant the normal size broom. Having a small combination like the OXO Tot will give you a handy broom/dust pan to use when small messes creep up unexpectedly. The mini broom replaces the typical long handle for a small, contoured handle that will fit perfectly in the palm of your hand. The compact size of the head is small enough to fit in difficult spaces or on other surfaces like counters and tables. 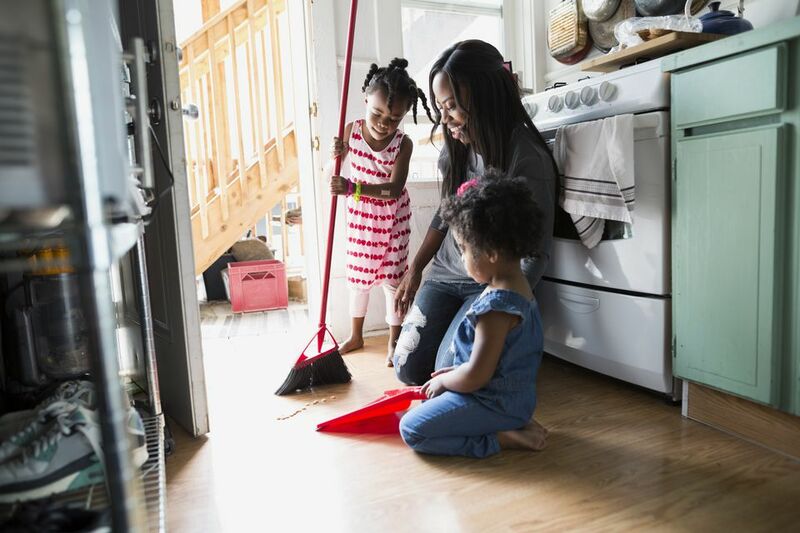 Molded to fit the shape of the dust pan, you can snap the broom into place for easy storage that won’t take up too much space in a closet or cabinet. With a push broom, you are doing a pushing motion instead of a sweeping motion. Used mostly outdoors to sweep up larger debris like leaves, sticks and other outdoor dirt, these brooms tackle areas much quicker than their classic counterparts and are easy to maneuver without getting fatigued. This bestseller from Amazon has stiff bristles which make cleaning rough areas like your sidewalk or driveway even easier. Another plus, its made out of 80% recyclable material. Want to take a look at some other options? See our guide to the best push brooms. Disclosure: At The Spruce, our Expert writers are committed to researching and writing thoughtful and editorially independent reviews of the best products for your life and your family. If you like what we do, you can support us through our chosen links, which earn us a commission. Learn more about our review process.